When the greatest snow on earth finally melts in Utah, everyone emerges from hibernation anxious to feel the warmth of the sun. Salt Lake City comes alive with people doing everything and anything outside. Eating is no exception. 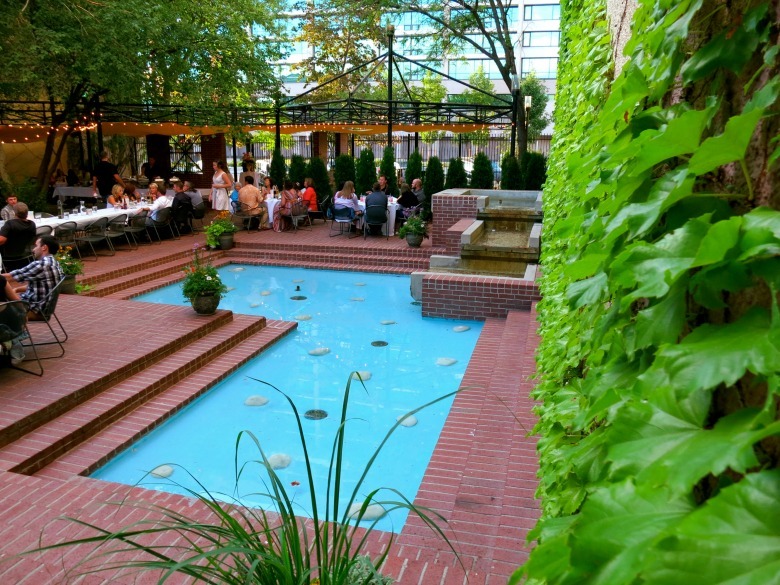 Dining outside is one of the best parts of summer in Salt Lake City. Nothing beats eating with friends in the fresh air with a front row seat as the sun sets into one of Utah’s notoriously gorgeous sunsets. 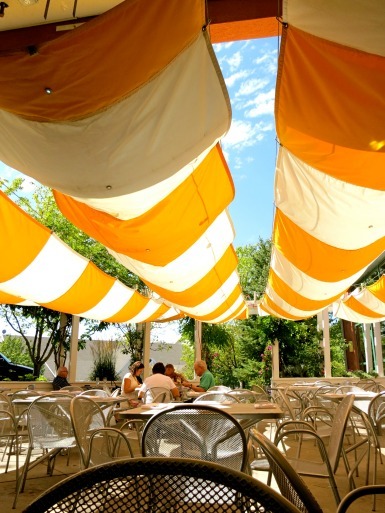 Here are the best restaurant patios in Salt Lake City to help you get the best of al fresco dining before we have to return to hibernation in a few months. Fresco Italian Café’s charming patio. Fresco Italian Café: One of the best patios in Salt Lake City is Fresco‘s quaint, cozy, ivy-lined patio that feels more like a good friend’s backyard than a restaurant. But as soon as the incredible Italian dishes emerge from the kitchen, there’s no denying you’re at an amazing restaurant. Open nightly for dinner. Aristo’s: In typical Greek fashion, the patio at Aristo’s is a welcoming space that’s often filled with lively tables of laughing friends. Perched on 1300 East near the University of Utah, the patio always feels a few degrees cooler than downtown, making it a perfect place to share a few plates of delicious Greek dishes with friends. Open for lunch Monday-Saturday and dinner seven nights a week. 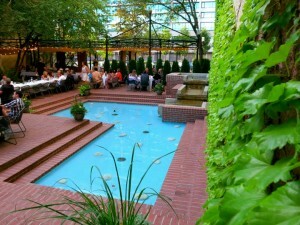 Caffé Molise: Tucked among downtown Salt Lake City’s buildings is Caffé Molise‘s hidden gem of a patio. The spacious patio has an ivy-lined brick wall, a gently trickling fountain and dainty lights strung overhead, creating one of the most beautiful, relaxing and peaceful patios in the whole city. Add their incredible Italian food and the combination equals perfection. Open daily for lunch and dinner, plus Sunday brunch. Café Trio: Both locations of Trio offer amazing patios for outdoor dining. The downtown location has a charming patio surrounded with greenery while the spacious Cottonwood one provides a picturesque view of the mountains. Both locations are open daily for lunch and dinner, plus weekend brunch. Copper Common: Copper Common’s patio is a prime spot for people-watching thanks to its location next to the movie theaters on Broadway. Grab a seat outside at the street-facing bar for front row to the stream of traffic or snag a table under the canopy for conversation. Open daily at 4 p.m., plus Sunday brunch. 21+ only. Pallet: Like the restaurant itself, Pallet‘s patio is cozy and cute, yet surprisingly comfortable. Even though it’s next to the parking lot, they’ve somehow managed to make the patio feel a world away from traffic — and a perfect place for sharing small plates and cocktails as the sun sets. Leave it to the creative folks at Pallet to pull off a feat like that. Open Monday-Saturday for dinner. The sunny and relaxing patio at Trio Cottonwood. Faustina: The classy, yet casual atmosphere of Faustina is transported outside to their patio, conveniently disguised by shrubs near the back of the building. There are plenty of umbrellas providing shade for those way-too-hot days and an array of fresh dishes to help you forget about the heat. Open daily for lunch and dinner, plus weekend brunch. 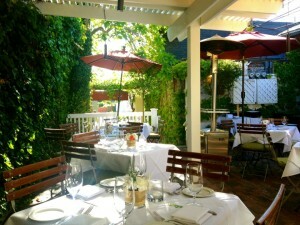 Wild Grape Bistro: The garden-like patio of Wild Grape is the perfect place to soak up the sun, sip on cocktails and munch on American fare. The casual space is so homey it makes you feel right at home. Open Tuesday-Sunday for breakfast, lunch and dinner. Now head to one of these restaurants (or better yet, all of them) and opt for the outside table! Kelli writes about adventures in food, arts and traveling on the blog RandomActsOfKelliness.com. She is determined to show the world that there is more to do in Utah besides the mountains, even though they are beautiful. Her travels take her around the world in search of opera, whiskey and a good bowl of ramen.